There was something strange about the little beings of light that hovered around Aerell. They swam through the air, unbound by gravity as they gathered around the wand she held in her hand. There was some fairy tale that had spoken about a wand with the power to create things. Aerell, of course, had dismissed such stories as nonsense. But these dreams were getting more and more vivid, and these beings — these creatures — seemed almost alive. The way humans were alive. They looked and moved and reacted to her as she held her hands out, looping around her arms. She couldn’t help but giggle as they seemed to be playing with her. Such curious little things. One perched on an outstretched finger of her free hand, its sharp little feet wrapping around it as it tilted its little head back and forth. It seemed to be trying to speak to her, but as always, the only sound she could hear in her dreams was her own voice. The dream was nice. She didn’t want to be saddened by the fact that she couldn’t speak with the little squirrels. 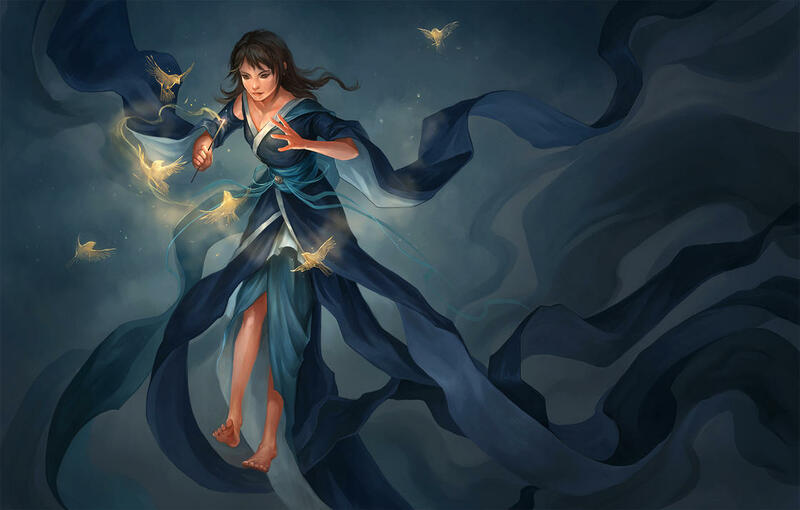 So instead she drew her wand up, light flowing outward at the tip, and swirled it about herself. The creatures swam about the air around her, following the trail of light. And with that, the creatures of light faded, along with the wand in her hand. She was no longer wrapped in long flowing robes that escaped out into infinity. Instead, she found herself tangled in the warm embrace of the blankets, and with how much of the heavy fabric had already fallen off the bed, it was threatening to pull her down now, too. She wanted nothing more than to remain in bed and succumb to the warmth of the blankets. It was so soft, so cozy. But her mother wouldn’t be happy with her if she did. She looked to the spring clock at the other side of the wall. Eyes half open, she couldn’t make out the details, but the big hand seemed to read seven. With an annoyed grumble, she tore herself from the covers and rose to her feet. She paused to stretch and yawn, then clothed herself before going upstairs. She didn’t bother to fix her hair. That was always a nightmare and a half, and was never worth the trouble. “G’night,” she said as she walked into the small dining room, lit by the hand crank lantern on the table. Her mother was spooning more cramseed stew into her father’s bowl even as he was eating it. He was wearing the new shirt Aerell had just finished knitting him, and it was already covered in stains, but she couldn’t be upset. It was only a matter of time. Aerell frowned. “But you made stew for breakfast? Why would you do that if we need water?” Her father nodded thoughtfully in between bites. “No ma’am. Sorry,” she sat down in a rush and her mother placed the giant bowl of stew on the table for her to use. The table was silent for a moment while they all ate. Well, as silent as it could be with her father slurping up the cramseed. “Where’s Rayek?” Aerell asked after some time, only just realizing that her mother never left a bowl out for him. “Your brother has been out collecting wood since noon,” her mother said. “He’s insistent on going down to the Ravine next week to sell as much as possible.” She sounded angry, but Aerell noticed her lower lip quiver. The way it did when she was worried. “He wore his suit out, right?” Aerell asked. Her parents exchanged looks. Her father shrugged as her mother bit her lip. “You’ve been told not to discuss such things, Aerell,” she said. The room went dark, and silence followed it. Aerell heard her mother sigh and the sound of hands tapping the table, looking for something. The sound of methodical, practiced cranking followed, and soon the lantern turned on once again. Her father placed it back down onto the table without complaint, but the conversation did not continue. Just as Aerell was finishing her meal, she heard the outside door opening from upstairs. The tension in the dining room immediately dissipated, and she threw her bowl down to meet her brother. Rayek was still removing the reflective suit piece-by-piece when she finished ascending the stairs. When he took off the helmet, his face and hair was a mess with sweat, but he had a grin on his face. “Good night, sister,” he said. “Just something I found in the forest today,” he shrugged. “Thought you might be interested.” He revealed his hand, which held a small straight rod that glowed at the tip.